"Volusion" Reviews (Apr 2019) - Why 4.7 Stars? Volusion is a fully hosted online store builder that caters almost exclusively to aspiring online retailers. While they're not as powerful or performant as competitors in the shared hosting space, they shine when it comes to the number of eCommerce-related features they offer. If you want to take your mom-and-pop shop to the web, you can do so with Volusion. “Founded by 16-year-old Kevin Sproles in 1999 as a web design studio, Volusion added eCommerce functionality in 2002 and hasn't looked back. More than 180,000 entrepreneurs have looked to the company for help hosting and managing their online businesses, and Volusion has processed more than 185 million orders worth $26 billion. “When folks typically search for cheap web hosting, they're often in need of a shared server provider that offers a basic site builder or easy integration with blogging apps or content tools. For folks looking to launch an online store, however, costs can rise with the addition of eCommerce-friendly features. Laura Bernheim (HostingAdvice.com): This rating is not available yet. We haven't evaluated Volusion for the "Dedicated" option yet as they do not currently offer this type of hosting service. We're always working to keep our reviews up-to-date so check back later! Does Volusion already offer the "Dedicated" option? Let us know. Laura Bernheim (HostingAdvice.com): This rating is not available yet. We haven't evaluated Volusion for the "VPS" option yet as they do not currently offer this type of hosting service. We're always working to keep our reviews up-to-date so check back later! Does Volusion already offer the "VPS" option? Let us know. Laura Bernheim (HostingAdvice.com): This rating is not available yet. We haven't evaluated Volusion for the "WordPress" option yet as they do not currently offer this type of hosting service. We're always working to keep our reviews up-to-date so check back later! Does Volusion already offer the "WordPress" option? Let us know. “Volusion launched the next generation of its eCommerce website builder, dubbed V2, in mid-2017 to much fanfare. The drag-and-drop builder and eCommerce interfaces are exceedingly more modern and user-friendly, but the company is still playing a bit of catch-up. Our biggest knock on the site builder when comparing Volusion to other eCommerce platforms is the lack of theme options, which we expect to be solved as time passes. At the time of writing, Volusion offers roughly 50 design templates, while competitors offer hundreds of choices. Volusion gives new customers 30 days to provide a domain name for their online store. We love that the company won't put stores on a Volusion subdomain but wish they could provide a one-stop experience by offering domain registration and hosting services. Offering the industry-standard 99.9% network uptime guarantee, Volusion will reimburse customers 5% of their monthly fee for each 30 minutes of downtime. Volusion's system is PCI/CISP-certified, meaning it has met the infrastructural security criteria to be considered a full-fledged web host. Although the company meets the criteria to securely process credit card information, store owners will need to purchase an SSL certificate before accepting orders. 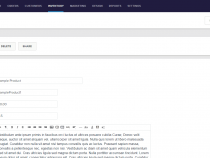 Free and premium templates for online stores can be implemented and manipulated via Volusion's drag-and-drop editor. Templates are responsive, so customers can access your online store via desktop, mobile, or tablet. Drag-and-drop functionality enables entrepreneurs to customize and optimize their content for conversions. Volusion's site builder allows for a variety of navigation styles, category and product organization, and an efficient checkout process. If you don't have the time or know-how to put your online store together, Volusion's team of in-house design professionals can help you elevate your branding and visitors' shopping experiences. On average, Volusion-designed stores sell four times more products. Showcase your products with unlimited photos and videos specifying the colors, textures, sizes, and styles available. Volusion can handle thousands of SKUs and will create custom barcodes for easy inventory management. Profit from customer purchases easily. Volusion allows you to accept payments from Visa, MasterCard, Discover, or American Express credit cards, as well as cash, wire transfers, money orders, Amazon, Google Wallet, PayPal, and Stripe. Sell and ship globally with a built-in, real-time tax calculator, currency exchange definitions, and configurable shipping options. Store owners can decide to require a signature, provide flat-rate shipping options, or set up drop shipping directly from the supplier to the customer. Volusion users can offer customers online coupons, gift cards, and promo codes, enticing them to continue shopping at your store. The included customer relationship management platform manages customer inquiries and interactions with aplomb. Market your products to former and frequent shoppers via email marketing and newsletters. Keep customers in the know about your store's latest product additions, news, and deals using Volusion's email marketing suite. Volusion also includes SEO tools to help you format your site to be better noticed by search engines. Plus, you can easily integrate your eCommerce store with social media platforms, including options to sell on Facebook, Google, eBay, and Amazon. Volusion was designed with the intention of helping store owners create an online hub to market and sell their products quickly and easily. The number of available themes has dropped considerably since the update, but we expect to see dozens more added in the coming weeks and months. 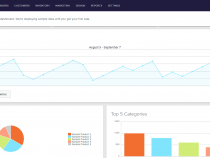 The majority of Volusion's features are centered around the idea of helping business owners track inventory and profit efficiently while making the user experience informative and intuitive for their shoppers. Entrepreneurs can easily customize their online storefront with Volusion's revamped site builder, which provides easy access to product display settings, navigation menus, and more. The drag-and-drop platform is tied in with users' store management systems, allowing business owners to easily switch between design tools and the features covering order processing, customer relationship management, inventory tracking, marketing, design, and analytics. Volusion seems to strike the balance between affordability and productivity, offering ample features and tools to justify what they charge. Naturally, the platform is significantly more expensive than free, self-hosted, open-source options, such as WooCommerce, Magento, or PrestaShop. Those services, however, require store owners to purchase and maintain a web hosting account. Although hosting can be procured for less than $5 per month, performance, security, and other features typically lag behind until you get to options priced comparably to Volusion. When examined alongside other commercial hosted services, Volusion is quite a bargain. BigCommerce plans start nearly twice as high and come with transaction fees on purchases made through external payment gateways. Although the themes available through each eCommerce platform are visually impressive, they're both typically priced beyond $150. 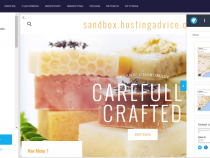 Wix and Weebly are priced equally or less than Volusion and offer cheaper themes, but the site builders include storage or product limitations and fees. Our only gripe with the Volusion pricing format would be the $7-per-GB for exceeding bandwidth limits, but a responsible store owner should be able to adapt to scaling traffic and upgrade to new plans as needed. As with seemingly every web hosting provider, eCommerce specialized or not, Volusion promises customers free 24/7 support and a 99.9% network uptime guarantee. Our support standards typically drop somewhat with eCommerce platforms, but Volusion puts forth a decent effort. Although we understand the upsell opportunities of offering priority support to the customers spending the most money on higher-tier plans, as Volusion does, we tend to gripe at hosts that limit support options for the small-time customers just getting started with the cheaper plans. Volusion reserves phone support to those spending at least $35 per month. As for the online-only support, however, we do appreciate the level of depth in the support articles, blog posts, and how-to guides, as well as the ability to relatively quickly chat with a Volusion representative, but we struggled with finding different resources quickly. Information is spread among the blog and help center on the Volusion website, as well as the store and account management interfaces. Wondering how Volusion stacks up againt other web hosting services? See our host-vs-host reviews below and compare them side by side. 2 out of 2 times. Volusion's major overhaul in mid-2017 was a giant step forward for the eCommerce platform, giving entrepreneurs and their customers more confidence in doing business together. The company streamlines the daunting process of starting an online storefront, finding success, and growing profits. We appreciate how many features and tools Volusion packs into the company's largely affordable plans, to say nothing of the hassle-free hosting experience. The Volusion website builder might not be quite as intuitive as some of the company's competitors, but motivated site owners should have no problem picking up the reins and taking control of their online business.